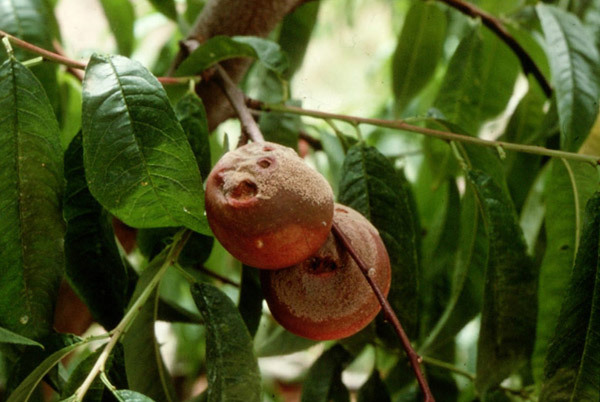 Brown rot control in your fruit – organically. One of my email subscribers just wrote to me and asked about brown rot in nectarines. As I had just posted about my great nectarine crop, I thought it would be a good idea to share the reader’s question for the benefit of everyone. Brown rot is a common problem that affects not just nectarines, but most fruit including apples, cherries and peaches. Thanks. I find your tips and chart very useful over here in Sydney. I have a question on my nectarine tree. This is the second year in a roll that they suffered from brown rot. The rotted fruits hanged on and dried up on the now dead branches. I have cut off these branches and throw away any of the rotted fruits that I can find. Any suggestion as to the cure for this? Will Copper Sulphate spray help? Thanks for your question and I’m glad you find the tips useful. Thankfully brown rot isn’t a condition I have had much of a problem with in my trees, but it can be a real issue as you describe. It sounds like you are doing the right things with pruning off infected fruit and branches. You should also collect any infected fruit from around the base of the tree. Don’t put them on the compost heap. Either burn or place the affected parts in a plastic bag and throw in the rubbish. In addition you can use Bordeaux mixture as a preventative. You should spray as the buds start to swell in spring. It is said you shouldn’t spray the mixture while the tree is in leaf, but I have done it in the past and haven’t seen any negative effects. The ABC has a great fact-sheeton making and using Bordeaux mixture, though their measurements make a very large batch, so I would scale it down. Those who have been following my mildew saga will know I had come down in favour of using sulphur to try to control it. Unfortunately that didn’t have the effect I was hoping (in fact it seemed to make no difference at all). 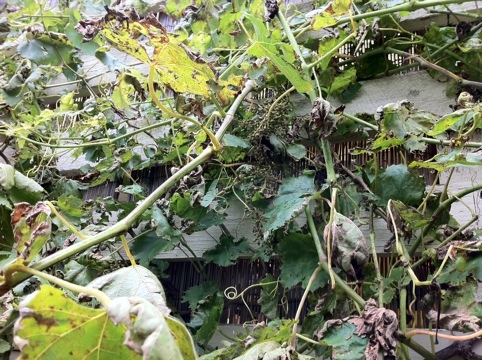 And it was starting to spread into the second vine I have. So despite the advice I came across I decided to use copper sulphate in a Bordeaux mixture. The good news is it seems to have checked the problem. And even better the vines are sprouting new leaves so they will at least build some reserves for winter. Next year we might get some good grape crops. Here’s hoping! Sulphur is the go for mildew! I went to look for copper sulphate as I talked about in my last post but it proved to be harder to find. I did manage to get some at a local stock feed store, but along the way I found some where selling powdered sulphur. It turns out sulphur is also good for fungal infections. So after doing some research on the Gardening Australia website I found that Bordeaux mixture is best used during winter when the plants have no leaves and that powdered sulphur can be dusted onto plants with mildew. So that’s what I’ve done. I’ll let you know how they get on. I’ve got mildew. Not me personally of course, but my grape vines. It was shaping up to be a bumper year for grapes with all the rain that we have had. However that has turned out to be the problem. The moisture in the air has resulted in mildew on the vines. Initially I thought I might be able to avoid spraying it but the rain has persisted and the mildew is getting worse. 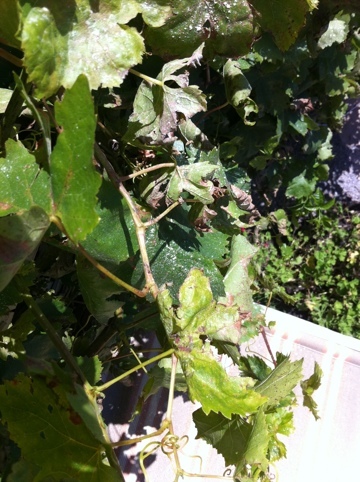 Unfortunately it has damaged the early grapes on one vine and I will have to take some action to prevent the other vine going the same way. But what to do? I know about Bordeaux mixture to treat fungal infections on grape vines but I have been unable to find the copper sulphate needed to make the mix. All the gardening books say it should be available in garden centres. But here in Victoria it isn’t. All I could find was other commercial copper fungicides and if you are an organic gardener you can understand my reluctance to use them. However it turns out that is readily available in stock/horse feed stores to treat copper deficiency. So tomorrow I will be heading down to buy some. Otherwise I’ll have no grapes left to eat.